It is good to be back in my home in Oslo, but I also miss being in Kathmandu or up in the Himalayas on an adventurous trek or expedition. Since I came home from my one and a half year journey in Asia last august, have I been working on where my next path on my life journey is heading. One thing is for sure I will try to follow my heart and see where it leads me. Maybe I will manage to make a living out of doing what I really LOVE, or maybe it ends up as a disaster. The only way to find out is to try and see what happens. I have started to take a few small, small steps on my new life adventure. 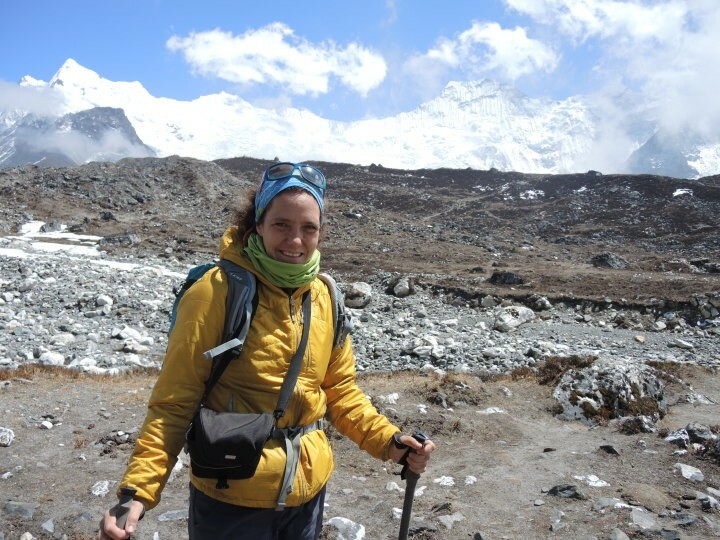 I am organizing two treks together with my friend and yoga teacher Ellen Johannensen that I met in Kathmandu in 2013. I have experience with business development from my former work so the planning phase, negotiating and selecting a local partner and designing the webpage to promote the treks, has been within my comfort zone. The phase I am in right now to brand and sell the treks is something that is outside my comfort zone. It is an area where I have to think far outside my box and be really creative. I have had a stand on a second hand market in Oslo on Saturdays this autumn. I have also had a stand outside the green grocer Frukthagen in Oslo. The experiences I have had on these stands is only positive so far. I meet a lot of interesting people that I would never meet where I regularly go. I get only positive feedback and a lot of BIG HUGS from strangers. So to those of you who reads this blog. Do you want to follow your heart? If yes what keeps you from doing it? This is a big, difficult and scary question to answer, and the answer is complex I know. Had it been easy to answer these questions and see clearly what the result of following the heart would be, would we have less suffering in the world and more people that followed their heart. To follow my heart is a demanding journey to be on. I do not know what the output of the journey I have started on will be. I have been fascinated by the writer Paulo Coelho for many years. His bestseller The Alchemist is a great book that I read again last summer. The book is so well written and it inspires many to dream about fulfilling their dreams and following their hearts. What I find after I decided to follow my heart, is that this journey that he describes in the book requires a lot of me on a personal level. I really have to work hard on myself and focus my energy in the direction I want to steer my life in to. I feel that I have arrived at a crossroad in a place I have never been before. I have taken a turn into a new road I have not been on earlier in life. It is unknown, it is scary, it is exciting, it is demanding and it is fun. I got to know a lot of interesting people that I would never meet if I had lived my ordinary life. The business I am working on developing in Nepal, gives me the opportunity to learn more about a new and totally different culture. I get the opportunity to use my skills on new businesses in new countries. I do not know why I am doing this. I just feel I have to try and follow my heart and see where it leads me.